LUA is a scripting language mainly designed to be integrated in host applications. It is the perfect tool to learn the basics of programming since it contains all the elements which are present in all the other programming languages. The host application which will make it possible to run the LUA code in real situation is Demoniak3D. 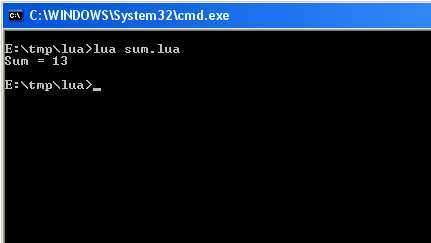 But we will also use the lua.exe interpreter for an immediate and simple command line use. LUA home page: the official website of LUA. 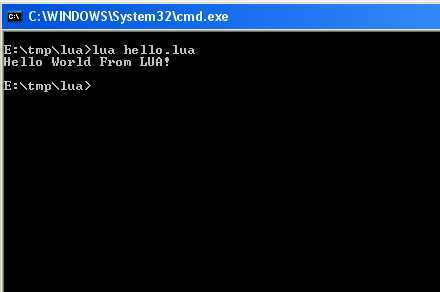 LUA.exe: LUA command line interpreter. XpConfigurator: the utility which makes it possible to add a menu to open a DOS shell on a mouse right clic. 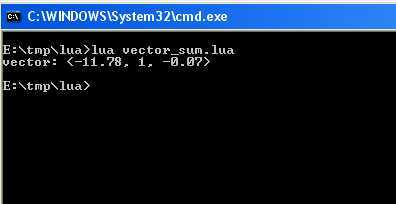 This is useful to test LUA codes with the command line interpreter. Code 1 - Hello World! Notepad++: simple, powerful, free and regularly updated. Syntaxic colouring for the main programming languages (LUA, XML, C/C++ HTML, VBS, Java...). Crimson Editor: simple, powerful and free. The updates are not very frequent. Syntactic colouring for most programming languages. Ultra-Edit: a very powerful text editor. Paying (approximately 40.00$). The variable is one of the most fundamental programming concept. A rather general variable definition could be: memory location for data storage. Like in many scripting languages (PHP, VBScript...), the variables in LUA are typeless. That means that a variable can contain a numerical value as well a string character, or even a variable (simple or complex). Fig. 2 - the adder in action. Another point that must be considered is the variables visibility range. By default, variables in LUA are global variables. 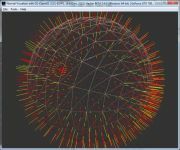 It means that variables can be used in various scripts, when these various scripts belong to the same execution context, as it is the case in the Demoniak3D demonstrations (initialization script, update script...). The global variables are thus very useful in all the cases where one needs to transfer data between various scripts, or when persistent data are required. We will see a "frames counter" example in one of the tutorials devoted to the use of LUA in Demoniak3D. LUA, like any other good programming language, gives the possibility to create functions. A function can be considered as a sequence of instructions masked behind a single name and making it possible to execute an action or to act on data. A function simply makes it possible to factorize the code in order to avoid coding several times the same succession of instructions. Existing functions: LUA standard libraries - such as the print() function. The interesting case is the user functions one. Fig. 3 - Addition of vectors. The conditional tests are done with the if - then - else construction. A simple example which clearily shows the conditional tests may be the solving of the quadratic equation: ax^2 + bx + C = 0.
text = "There is no real solution." text = "There are two real solutions: x1=" .. x1 .. "
The iterative structures make it possible to repeat a sequence of operations several times. The iterations are done with while / do-while / repeat-until / for. It is possible to prematurely leave an iteration with the break key word. Part 1: creation of a table containing MAX_SIZE elements. The value of each element is randomly generated thanks to the random() function of the LUA standard math library. Part 2: sorting in descending order the elements of the table using the bubbleSort algortihm. Part 3: display of the sorted elements. Fig. 4 - Bubbles Sort. Always add a semicolon at the end of each instruction. Indeed, LUA is very flexible and does not oblige to specify in an explicit way the end of an instruction. But it is recommended to do it in order to simplify the work of the LUA parser / compiler. Correctly indent the code and respect the identation hierarchies. See the bubbles sort algorithm for an example. Prefix a table type variable with arr. Example: Arr_sphere_clones or g_arr_sphere_clones if the variable is a global one. Prefix a variable with I, F or str to indicate if it contains an integer numerical value (I), real (f) or a character string (str). Example: g_i_status, str_name, g_f_position_x. Page generated in 0.0033369064331055 seconds.